If you look at a map of the emergence of Brood V of the 17-year cicadas, Magicicada septendecim (what a great name! ), for example at cicadamania.com, it looks like almost the entire eastern half of Ohio was destined for the same experience. As we know by now, though, it is not one size fits all. 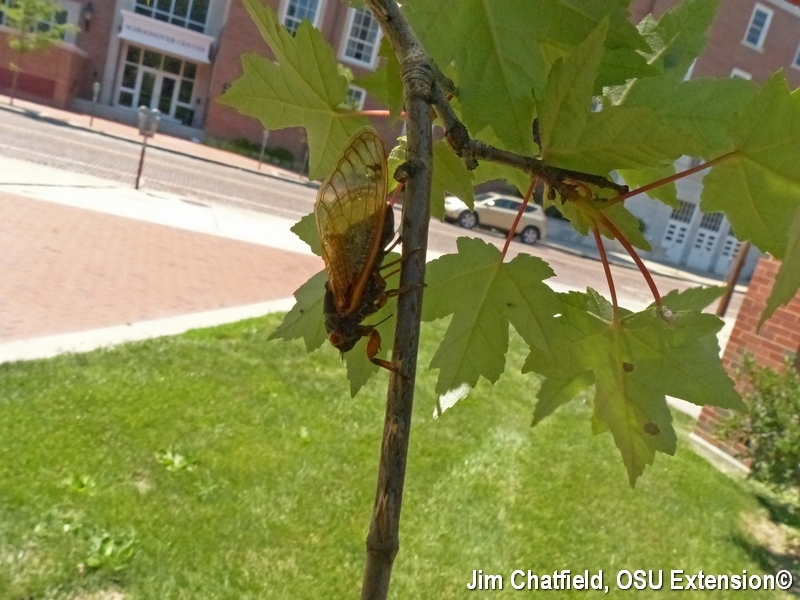 Go to the OSU Mansfield Campus and the cacophony is big-time, go to Wooster and it is the late spring quietude, until dog-day cicadas, which we hear every year arrive later in the summer. Twenty miles south at Mohican State Park and the male cicadas choir is signing in noticeable numbers. Ashley Kulhanek of OSU-Medina County reports that some parts of the county have these noise-makers, others do not. Drive to southeast Ohio last weekend and even with closed windows and the radio on you realize there is a pitch of a different tune. My wife and I drove and hiked that way last weekend, and in addition to the sound from the male abdominal tymbals and echo chamber it is also quite a sight: of cast cicada skins, of emergence holes and areas of predator feeding on the ground, of flying adults running into the car and buzzing from trees, and of females ovipositing (laying eggs) in twigs. The female cicada uses its sharp abdominal ovipositor to slit those twigs, laying eggs that hatch, followed by nymphs making their way back into the soil to casually feed on roots for the next 17 years before emerging again. Damage to the plant roots is not considered significant, adults feed on sugary sap in the plant stem’s xylem, and twigs effectively damaged by the oviposition slits generally are no worry relative to plant health, though tell that to a nurseryman or fruit tree grower and they rail against losing a year’s growth, quite important if other competing nurseries are not affected. Context is everything. At least in the human-ish short-term, for the most part cicadas stay put and the different periodical cicada broods are consistent from cycle to cycle. Geography is destiny; cicadas do not fly to far afield and if one does it risks not finding a mate to start the reproductive process anew. Cicadas will soon put this emergence behind them and singing will stop within a few weeks, but in affected areas you will soon see the twig dieback as the oviposition-damaged conducting system of the twigs results in discolored and wilted leaves and twig death outward from the slitted twigs. This soon shall pass and stem damage will not be noticeable after a few years, but cicadas shall remain with us, sight unseen underground – for awhile. Not so old, really, relative to cicadas, found in the fossil record all the way back in the Permian period, some 250-300 million years ago.